Please allow me to brighten up this historically ill-fated day for you. Chocolate! Cream! Pie! Pi! Yesterday* was 3/14, Pi Day, that under-appreciated holiday on which we gather together to eat pie and give thanks for our ability to calculate the area of a pie plate. Well, maybe you don't. But even if you don't care much about the math, I think we can all agree that an excuse to eat pie is worth celebrating. 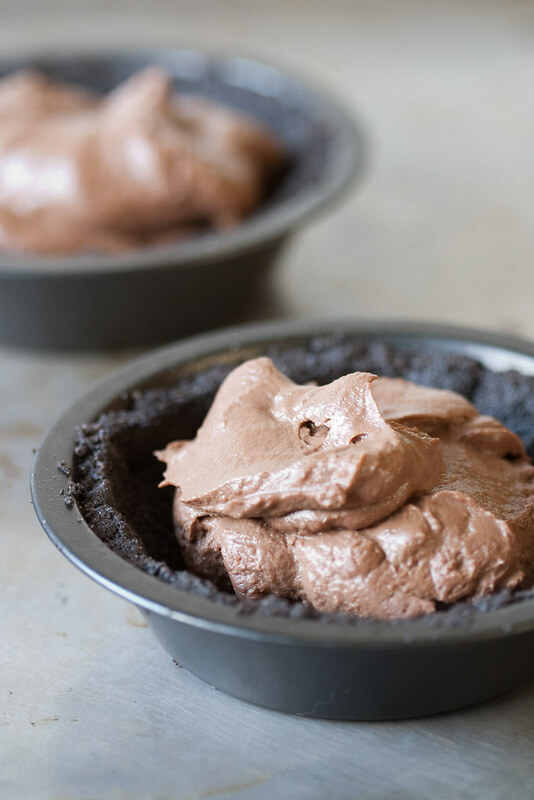 Unlike with some pies, there's really no way to convince myself that chocolate cream pie is good for me. It consists entirely of cookies, butter, pudding, and cream, so there's no getting around it: this is one of those desserts you can't justify making for anything other than a special occasion. I've been waiting months for a good excuse to make it, so when someone reminded me that Pi Day was coming up, it didn't take me long to decide. Chocolate cream pie was the one. And what a pie it is. 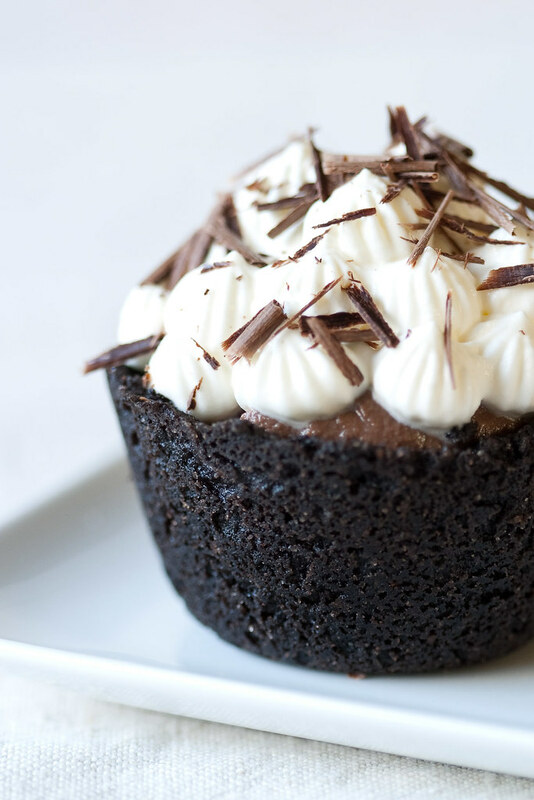 A pulverized chocolate cookie crust, chocolate pudding for filling, and whipped cream to top it all off. What's not to love? 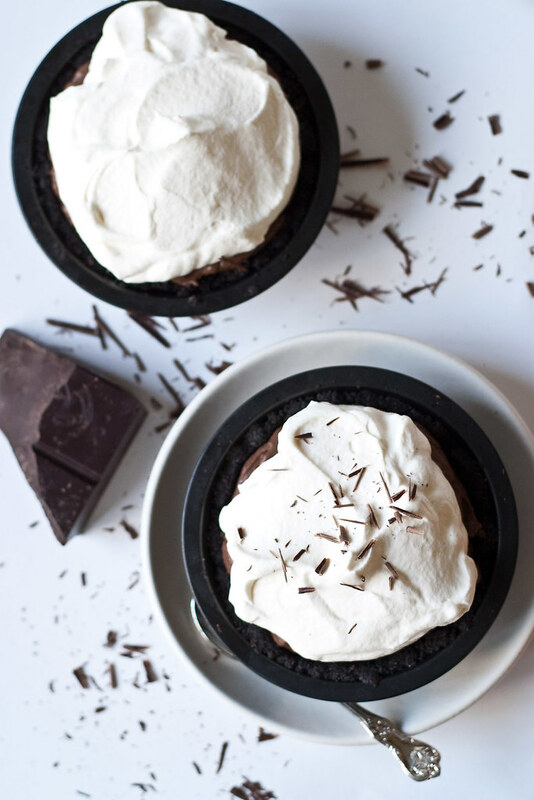 No doubt about it, this pie will turn your frown upside down. Even the preparation will elicit a smile, especially from those for whom success with traditional pie crusts remains elusive. You'd have to try hard in order to overwork this crust, which comes together quickly and is simply pressed into place. The only aspect of the pie that might give one pause is the pudding. To that I say: arm yourself with a whisk and a sieve, and all will be well. By the time you've finished, you'll realize that the hardest part is being patient enough to let it chill for six hours before you dive in. Hungry for more Pi Day fun? Head on over to Amy's, where fall flavors made a guest appearance for this late winter celebration. Did you make a pie for Pi Day? Please share with us in comments! Place an oven rack in the middle position, and preheat the oven to 350/175C. Combine the cookie crumbs, butter, sugar, and ground cinnamon (if using) in a bowl and stir until uniformly mixed. Pour the mixture into a 9-inch pie plate, pressing on the bottom and sides of the dish to compact the mixture into an even crust. Bake the crust for about 15 minutes, or until crisp, then set on a rack to cool. 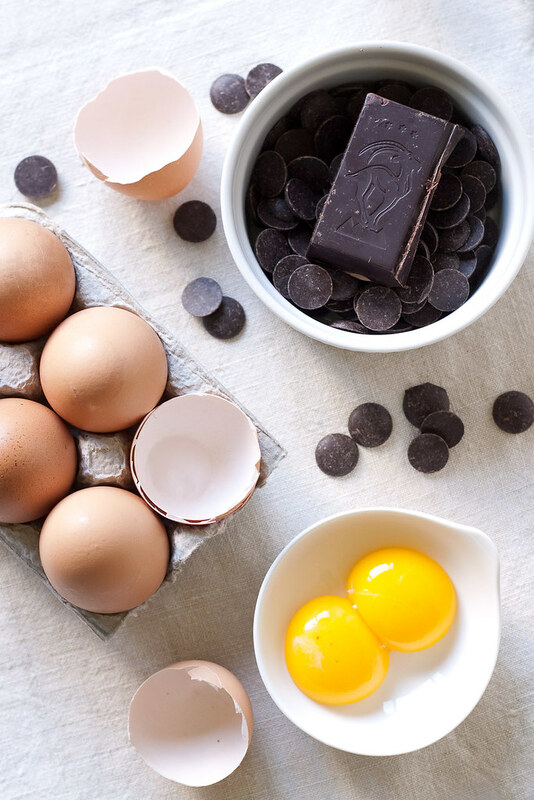 Meanwhile, place the two chocolates in a large, heatproof bowl and place over a pan of barely simmering water (the bowl should not touch the water). Stir the chocolate continually until it is melted and smooth. Remove the bowl from the heat, place a fine mesh sieve over the bowl, and set aside. In a medium bowl, whisk together the egg yolks, sugar, cornstarch, and salt until thick. Heat the milk in a heavy 3-quart saucepan until just simmering. Ladle some of the milk into the egg mixture, whisking vigorously, to temper the yolks. Once the tempered mixture is smooth, pour it into the pot with the rest of the milk, whisking as you go. Cook the custard, whisking constantly, until it thickens and reaches reaches a boil. Turn the heat down slightly and cook, still whisking, for another minute. Pour the thickened custard through the sieve into the chocolate. You might need to help it along with a spatula. Whisk the chocolate and custard together until they're evenly mixed, then add the vanilla and the softened butter, and whisk to incorporate. Butter a piece of waxed paper and place it, buttered side down, on the surface of the custard. Let cool completely, roughly 2 hours. Spoon the chilled filling into the prepared crust, then loosely cover the pie and place it in the fridge to chill for at least 6 hours, or up to 1 day. Just prior to serving, place the cream and sugar in a large bowl and beat just until the stiff peak stage. 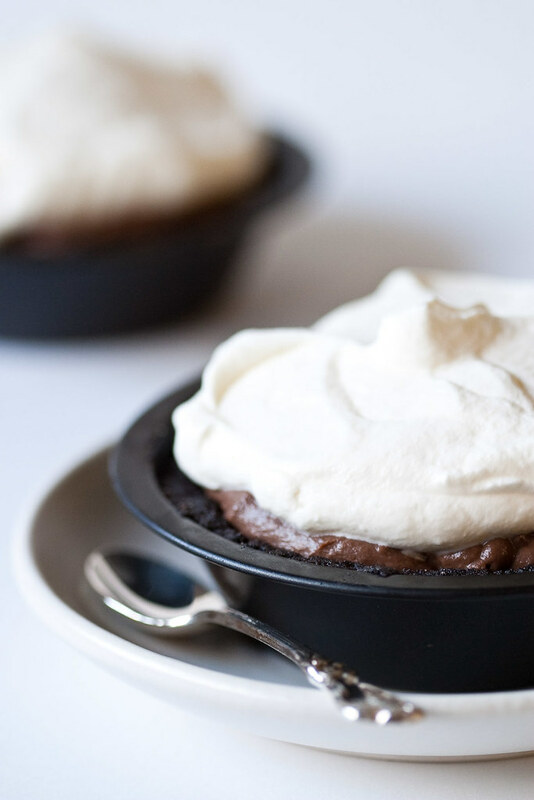 Spoon the whipped cream on top of the pie, and serve. Make-ahead: as noted in the recipe, the pie can be made and filled (but not topped) up to 1 day ahead. If you'd like to reduce the amount of sugar in the filling, go ahead. I wouldn't cut it by more than half, though. * Yes, I'm a day late with this, and here's why. I dare you to be annoyed with that face. Absolutely no way to make it "healthy"? I'll prove you wrong: dairy is good for you, as it has calcium which is essential to strong bones. Chocolate has antioxidants. And we require a certain amount of natural fats on a daily basis. 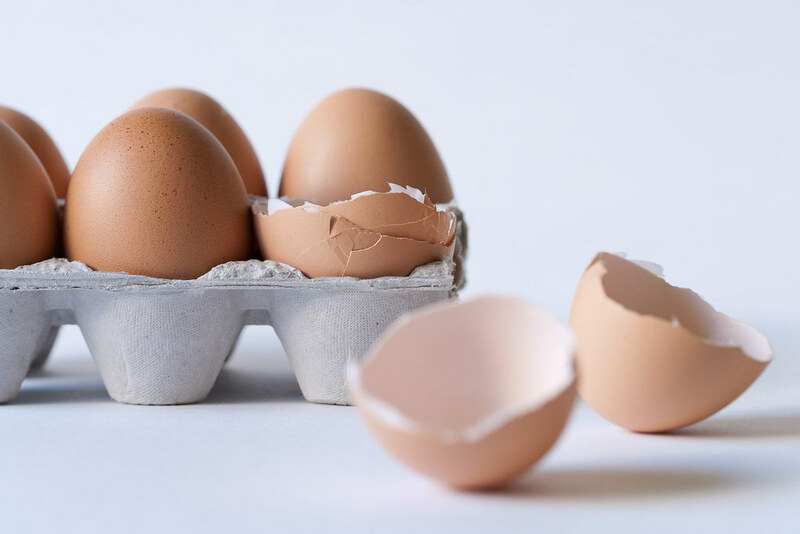 The eggs also have protein and omega-3's which surely can't hurt. Did I do it? Either way, that is one gorgeous Pi. Wow, I need to rewind and go back to celebrate pi day with some of these! Oh, lovely! I think Pi Day deserves this wonderfully, rich treat. I like how you made individual pies. Gorgeous piping in the last photo. I will keep this pie in mind for when I think that I deserve a major indulgence. Georgous & marvellously lookinf fab desserts!! I LOVE Pi day. Appeals to the latent geek in me (and the fact that you eat pie isn't so shabby, either! ).